(PRLEAP.COM) Superior Coin, a global Cryptocurrency company (www.superior-coin.com), announced today that it has officially launched additional tools to assist current holders of the coins, and to help others mine more coin in a easier fashion. According to Michael Senn, Superior Coin CEO the new mining developments and tools are more closely aligned with the company's strategic vision for growth and expansion over the next decade, and beyond. Superior Coin is a secure, private, untraceable cryptocurrency. 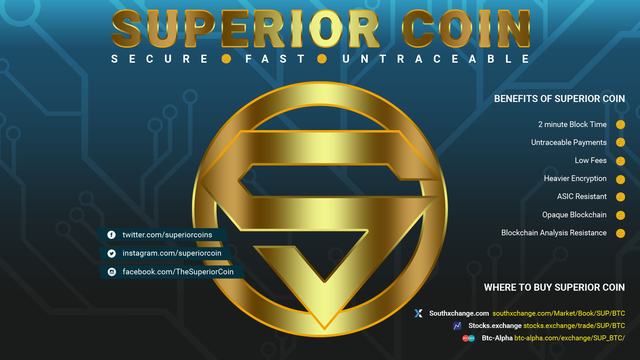 Unlike many crypto currencies that are derivatives of Bitcoin, Superior Coin is based on the CryptoNote protocol and possesses significant algorithmic differences relating to blockchain obfuscation. With each new integration of the software the development team has diligently strived to improve, and to release new software tools to the public. It is with the roadmap of the project to implement these tools for the average crypto enthusiast who lacks the machines to mine on an industry level. Superior Coin aims to help the average person gain a foothold with the cryptocurrency mining space by enabling the average person to mine via browser mining or GPU mining rigs. In today's crypto society people want access to new technology, and superior coin aims to make this happen. If you would like to learn more about this concept and how you can start mining visit Mining Superior Coin today.